My mother had the most exquisite perfume bottle given to her by my Godfather many years ago, I have never seen anything quite so beautiful. 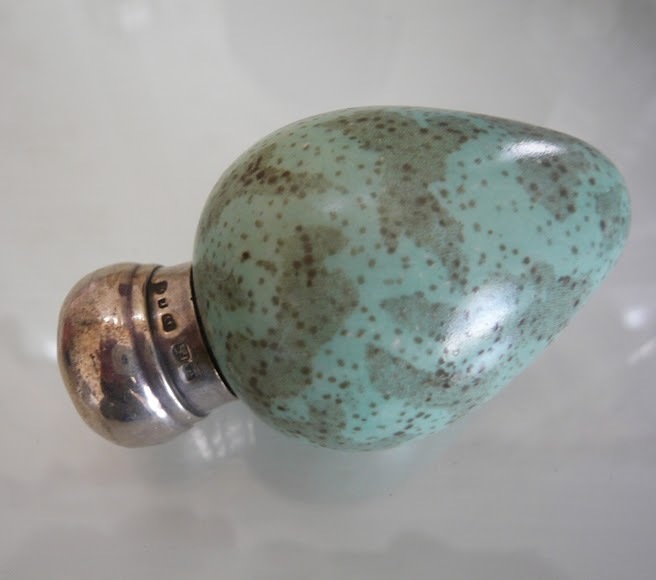 The delicate, porcelain blue speckled egg with its little solid silver screw on lid sits proudly on her dressing table. Although the egg is a copy of a blackbirds egg, it's the classic "duck egg blue" I adore. I am sorry I don't have a photo of it to share with you today but promise to get one tomorrow and add it to this post because it truly is a thing of beauty and when I inherit it I will cherish it forever. I do, however, have a collection of images for you in varying shades of blue. Hopefully these photos inspire you to find a place in your home to add a little of this colour whether it be a throw on your bed, accent pillows, a vase or even a photo frame. I am excited to be using this blue as an accent in my own "soon to be featured" bedroom. photo source - unfortunately I cannot find this shot again, please if this belongs to you, email me and I will credit correctly. Addendum: Photo of my mothers antique porcelain perfume bottle with hallmarked silver lid. My whole house is neutral paintwork in Resene Ricecake and Resene 1/4 parchment but after seeing the gorgeous colour of this hallway I wish I actually had some colour in my house. The bonus I guess for me is using accessories to bring colour in, I can always change or add to my accessories but it's expensive to change paint. Nevertheless, I love the colour of this hall. Don't you just love this old table and gorgeous blue bowls. The overall look is soft, fresh and definitely uncontrived. I have just noticed, coincidentally, my "links" reflect my love of this blue. 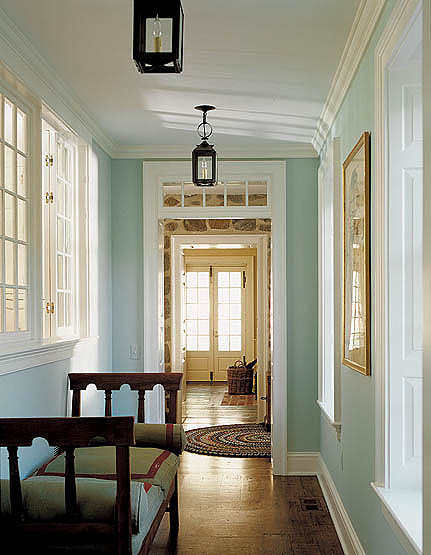 By bringing some duck egg blue into your home!